Pretty neat for five watts to a Hamstick on the roof of my pickup parked overlooking White Bird summit in Idaho County, Idaho! 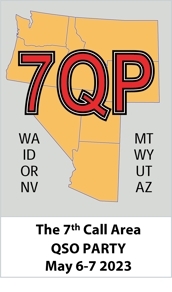 I activated four counties in Idaho and one in Washington during the 2012 7QP. The Idaho counties were Valley, Adams, Idaho, and Lewis. Prior to this year Lewis Co. had never been on the air for any of the previous five 7-Land QSO Parties. In Washington I operated from Asotin County. 102 QSOs for a score of 9,090 resulted from the 8 ½ hours I was on the air using a K2 on 40, 20, and 15 meters. Friday afternoon I drove the 180 miles from home in Moscow, ID to New Meadows, ID. Fresh snow was visible in the mountains to the east where I was going to start the contest in Valley County. Saturday started with a thin layer of ice on the road to McCall in Valley County. Starting at 1300 Z on 40M I couldn’t get anyone to answer my CQs or calls to them. Keeping to my published plan, I stayed on 40 for an hour with only a single QSO to show for it. 20 produced much better and soon my planned two-hour stay was up. Without a driver, I shut down shop and drove down the now ice free road to Adams County and was on 20 within 20 minutes after leaving Valley Co. Drizzle, fog, and sleet were my intermittent companions at the pullout for the 45th parallel. Another two hours of operating on 20 and 15 yielded 33 more QSOs, but again, few answered my CQs. It was 66 miles to my operating site atop White Bird Summit in Idaho Co. I think every one of the 40 QSOs required a repeat of the IDIDA exchange. By 2200Z in Lewis County, 20M for my five watts wasn’t yielding much and 40 had very little activity I could hear. Beginning in Adams Co, I discovered that K7EAR, the EAARS operation, was a great way to start each county. I got them in all five counties. When I got to Asotin Co, WA, I needed only three more QSOs to reach 100. I got them quickly, called it a day with 8 ½ hours of operating and 5 ½ hours of driving, and headed for home. N1MM in rover mode worked well all day. If I do it again next year, I will forget about 40 and just concentrate on 20, 15, and, hopefully, 10 m.
The things I will remember about the 2012 effort were the great scenery from my operating sites and the always loud signals from K7EAR.